The prosecutor general on his Facebook page listed five crimes involving Yefremov, in particular, the organization of seizure of the building of the Luhansk Regional State Administration (Part 3 of Article 27, Article 341 of the Criminal Code of Ukraine), an accessory in the capture of the administration building of the Security Service of Ukraine in the Luhansk region (Part 5, Article 27, Article 341 of the Criminal Code of Ukraine). Yefremov is also suspected of state treason (Part 1, Article 111 of the Criminal Code of Ukraine), activities deliberately undertaken by a citizen of Ukraine to diminish the nation's sovereignty, territorial integrity and independence established by the Constitution (Part 3, Article 110 of the Criminal Code of Ukraine). He is accused of supporting and establishing a terrorist organization - the so-called "Luhansk People's Republic" (Part 1 of Article 258-3 of the Criminal Code of Ukraine). 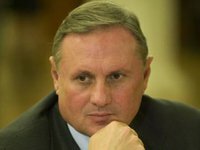 As reported, Yefremov was arrested on suspicion of diminishing the territorial integrity of Ukraine on July 30 at the airport in Kyiv. He is suspected of assisting the self-proclaimed Luhansk People's Republic, as well as embezzling from Luhanskvuhillia coal mining enterprise.